I have long been expecting that OverDrive, the dominant player in the library ebook market, would one day be acquired by a bigger fish who wanted to secure control of a market, and today that finally happened. Rakuten and OverDrive announced on Tuesday that the latter had been acquired by the former for $410 million. The deal is expected to close in April this year, after which OverDrive will continue to operate as a wholly owned subsidiary. OverDrive is a leading player in the library ebook market, and it distributes audiobooks, ebooks, music, and video to over 30,000 libraries and schools around the world. It also counts a number of retailers among its customers, including Waterstones (which sells Kindles in store but also has its own ebookstore). Rakuten is a $5 billion a year Japanese conglomerate with a presence in a dozen retail markets as well as a solid core business in the financial services industry. OverDrive is the third digital publishing company Rakuten has acquired in the past 4 years, and perhaps the 8th or 9th media company (this is important, trust me). Rakuten bought Canada-based Kobo in late 2011 for $315 million, and followed that up a short while later with the purchase of Aquafadas, a French company which offers a platform for building and distributing apps and Epub3 ebooks (it also builds said platforms under contract for other companies, including one for Kobo). Yes, OverDrive is selling today for more than the asking price of Kobo 3 and a half years ago. This can be explained by the fact that Kobo was sold before the bubble burst, and also because OverDrive is profitable (Kobo was and still is a money pit). Rakuten hasn't shared many financial details from OverDrive, but they did say at the press conference earlier today that OverDrive generated an EBITA of $25 million in 2014. There's no info yet on annual revenues, but Rakuten did say that they expect the acquisition will push its ebook division into the black in 2015. The purchase will likely also have a positive synergy with Rakuten's other media companies. It's a little too early to predict exactly how it will play out, but I expect that OverDrive's experience with distributing audiobooks, music, and video will also prove useful. So is anyone surprised by today's news? I'm not. I've been expecting this deal since July 2013, only with a slight difference: I thought Amazon, and not Rakuten, would buy OverDrive. In fact, when OverDrive had that Kindle ebook snafu last month I wondered whether that snafu was actually an Amazon negotiating tactic. It really could have been, but there's no way to tell for sure. Interesting. Cannot help but think that one of the reasons they are acquiring Overdrive is that Kobo has not performed to expectations. I find this interesting indeed. And I wonder if Amazon will view Overdrive as competition more so that it already does. OD isn’t a competitor so much as it’s the biggest fish in its pond – the kind of fish Amazon usually tries to buy. Oh, yes, it is a competitor. Anytime you have a place where someone can get ebooks (instead of buying from Amazon) it’s a huge competitor and in this case, you had some big name authors that people could have for taxes already being paid. Publishers already weren’t too happy that Amazon had worked a deal with overdrive to get data from them on books that were checked out in Kindle format by virtue of running the checkout via Amazon (I have to wonder if that will change…and who would code it…and how it would work…) . At any rate, I always felt some of the Prime lending was to keep people at Amazon–and away from other lending mechanisms. It hasn’t worked, of course and I don’t think even KU can compete with Overdrive as far as selection (they are very different selections) and end user cost. I don’t know that much will change, but I still find it quite interesting. There is more to Overdrive thsn their library business cash cow. They sell ebooks themselves and enable others to set up ADEPT ebookstores, so they are Amazon competitors in that sense. And, while Rakuten hasn’t integrated Kobo into their portal, Overdrive could easily give them a Rakuten-branded ebookstore in a few months or even weeks. This deal doesn’t exactly strike me as a Rakuten vote of confidence in Kobo. The big 4 or 5 bookstores account for 98% of ebook sales, so the stores supplied by OverDrive and Ingram are so small that they don’t amount to much in the way of competition – at the moment. But OD’s white label platform offers the potential of creating additional threats in nascent ebook markets. That makes it a potential threat more than an actual threat. I think this is big news! I have friends in the public library system and OverDrive is the biggest single player for libraries. I wonder if Rakuten bought them just to stop Amazon from buying them? And I wonder if they will try to make it difficult to put library books on a Kindle? I don’t think that would be a good move for anyone. Amazon wouldn’t want to give up on the data, and Rakuten wouldn’t want to make its new purchase less appealing to users. Overdrive goes where the money is: when Lit meant money, they supported Lit. When mobi mattered, they supported mobi. Ditto with epub. They’re not crusaders. And they are not without competitors: if they choose to cut Amazon off, Amazon can alwsys go to 3M or B&T. And then the question becomes: how many libraries would switch in order to kedp on offering service to Kindle owners? As a librarian (and MPOW’s digital librarian at that) I can say for certain that we will follow what the patrons want. Nearly all of our collection development is driven on usage stats. Currently OD rules the roost with our ebook usage (something like 80-90%) and 60% of that usage is Kindle format. We were concerned for a while when the “technical snafu” was happening b/c we were not getting Kindle versions and that did lead to a noticeable impact in our usage stats. If Rakuten makes it difficult to get KIndle books on Overdrive and Amazon moved to another provider, we almost certainly will switch (currently we offer both OD and 3M). Here is some story from Rakuten’s home ground, Japan. Rakuten’s acquisition of Kobo was very timely related to Amazon’s global strategy on Kindle. Their Kindle service started in 2012 when their UK and others. Now Kindle service is provided in 13 countries including the US. Prior to Amazon’s Kindle started the big publishers here call it “Black ships” arrived again just like 150 some years ago when US navy ships came here to force opening up old Samurai country. I understand that OverDrive has not provided Kindle format ebook outside of the US according to their news release on their site. 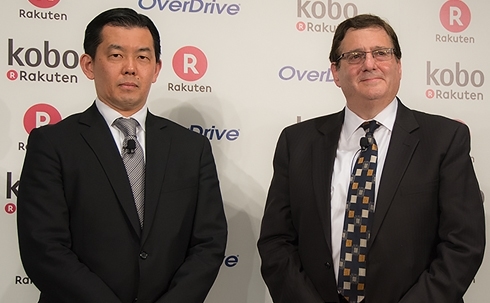 (http://company.overdrive.com/news/overdrive-announces-agreement-for-acquisition-by-rakuten/) Digital library is just starting here. It seems very certain that OverDrive will take a very large chunk of it very soon, which I think is Rakuten’s primary purpose (to protect “publishing culture” and business, next to their global business strategies. Kent Ohyama, author of Ultimate Guide to Kindle eBook Reading Life, best seller in Kindle in Japan.